Can we start by talking about these ASOS boots, how gorgeous? The sock book silhouette and the intricate brocade, make these something special, a great highstreet statement piece - would team with a pair of black skinny jeans and the cute Chinti & Parker Miffy cashmere jumper. The Topshop soft blazer is something i need to add to my work wardrobe. Perfect for throwing on over a simple tee or a dress - the print is very subtle but elevates it from a simple black blazer. 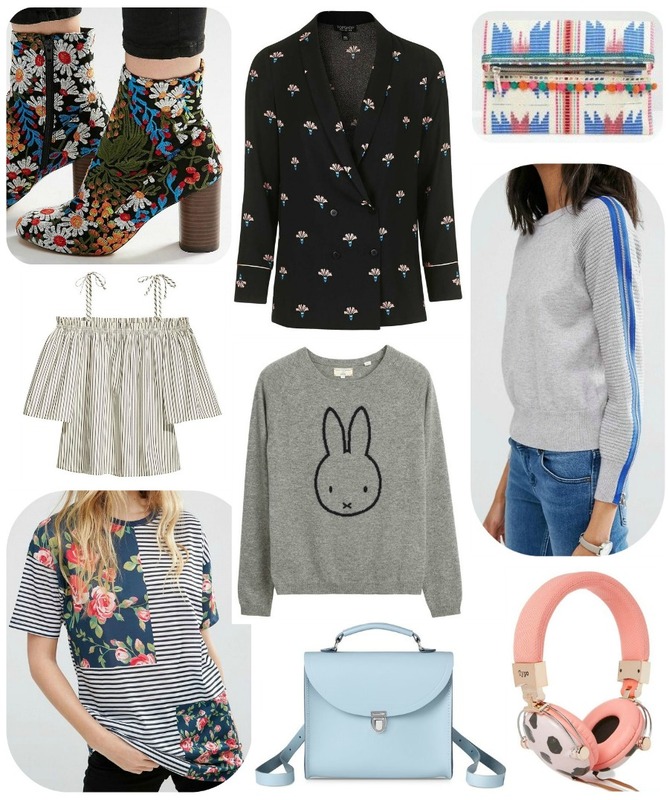 The odd piece on this wishlist is the headphones....i have never before wanted a pair of large headphones, much prefer the in ear style from Happy Plugs, however when i saw these from Typo i decided i need to give them a try. Love the colour, the rose gold hardware and the simple spot print - the perfect combo. Finally this zip sleeve jumper is so quirky and individual, don't think i have ever seen anything else like it. Love that it is a simple textured grey knit but with this pop of colour and detail on the sleeves. I like to have pieces like this is my wardrobe as they are great layering basics but this kind of detail just makes them a little more special.